sorry about the flash, the nonflash one was way to icky. I'm in overflow mode of happiness-love-filled-joyousness i must say. 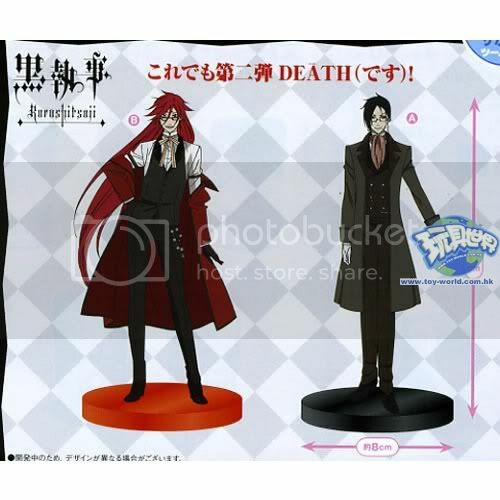 I've now pre-ordered the 2 SEGA kuro figs that come out in Feb. Sebby #2 and Grell, just because i've seen the niceness of the 2 above. Whut? LJ logged me out? Hm, thought so. The pics look promising, but I think I'll pass HLJ's early bird pre-order and wait for at least a prototype. I almost completely missed those 2 07-ghost books as well. not sure how. 07-ghost book *o* i wanted to buy it but i wanted to see what's inside it first do you will take pics inside it for me please? which 07-ghost book? the fan book or the postcard one? okay i'll try to take some pics of it when i get home from work. so much basara luv packed in there.